Q: Do you offer coverage on a RV if it is being used as their primary residence? A: Yes, we offer coverage called Emergency Expense Coverage. This coverage help with lodging expense and transportation so you and your family can still enjoy your vacation. 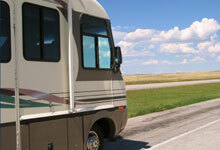 Q: If I am on vacation and my RV is damaged, do you offer coverage that will help me on expenses for lodging? Q: What is agreed value coverage? A: Agreed Value protects your investment in the RV without the worry of depreciation for total losses. The total loss payout is the Agreed Value as reflected on the declarations page. Proof of value is required for this option. For RV’s purchased within the last 2 years, proof is the purchase documents. For RV’s purchased more than 2 years ago the proof is an appraisal. Q: What is Vacation Liability? A: Vacation Liability is included with Comprehensive and Collision Coverage except on policies with the Full Timer’s package. Pays up to specified limits for bodily injury and property damage for which you are legally responsible as a result of an accident that occurs while the RV is used as a temporary vacation residence. Coverage is only available to pleasure users.